Big Walnut’s Alexis Schone (15) and Buckeye Valley’s Kennedy Wirth battle for possession during the first half of Thursday’s Division II district tournament game in Sunbury. 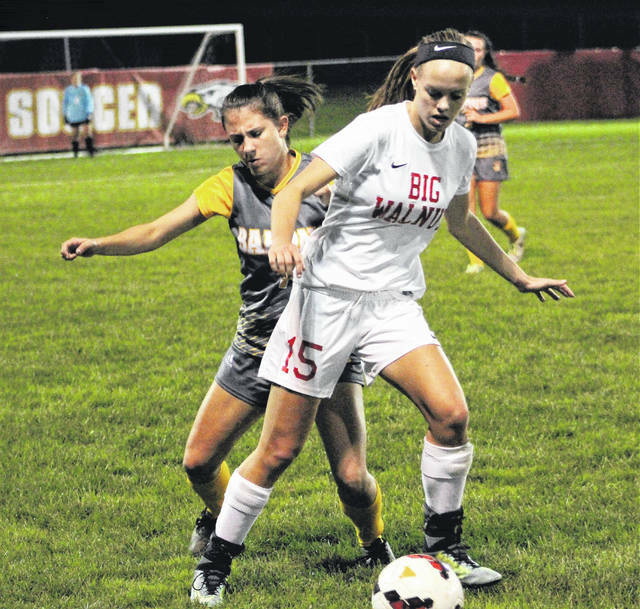 Sophomore Alexis Schone scored two of her three goals in the first five minutes of the second half to give the Big Walnut girls soccer team some breathing room. The second-seeded Golden Eagles cruised to a 6-1 win over visiting Buckeye Valley in the second round of the Division II district tournament Thursday night in Sunbury. The game wasn’t without controversy, though. Down 2-0 in the second half, Buckeye Valley was awarded a goal with 2:21 left in the half. Hannah Cowan’s corner kick appeared to hit the left post before being cleared. The referees determined moments later that the ball broke the plane. Jillian Hon was credited with the goal for the Barons. All-in-all, it didn’t matter. Schone scored twice in a span of a minute and a half to break the game open for the Eagles (12-2-4). Her first goal beat the goalie high and she headed in the second one off an Emma Padgett pass. Alexis Schone rebounded a Grace Bodker shot and scored to give BW a 1-0 lead with 31:13 left in the first half. Kaitlyn Meade put the Eagles up 2-0 on a free kick with 7:14 left in the opening half. Avery Schone and Morgan Bodker added goals late in the second half to give BW its final margin of victory. BW goalie Payton Carter was denied a ninth shutout in the last 10 games. The Eagles picked up their seventh straight victory and are 9-0-2 in their last 11, having allowed just three goals over that stretch. She finished with three saves, nonetheless. Camryn Crawford stopped five shots in net for the fifth-seeded Barons (11-6). BW advances to the district semifinal round and will host seventh-seeded Bishop Hartley Tuesday night at 7 p.m.